Widely regarded as the most significant play of the 20th century, Waiting for Godot is something every theater lover should see at least once. What playwright Samuel Beckett built with this work was a monument -- not of stones, but of words -- to the mysteries of existence, and his towering achievement moves and unsettles audiences like no other play. On a lonely road beneath a barren tree, two vagabonds wait for a man named Mr. Godot. As the evening unfolds, a desperate, humorous and unchanging universe is revealed, delighting and challenging all those who experience it. Directed by the Tony Award-winning Garry Hynes, Waiting for Godot makes its regional premiere at Lansburgh Theatre. "...Not to take anything away from the estimable, affectionate staging brought to Shakespeare Theatre Company by Ireland's Druid theater, but I wager that a revisit is essential only for those who've never had a "Godot" experience, or for those who can never get enough. With great works of theatrical art, and "Godot" is one of those, it's true that you can always hear a line spoken differently, or see a bit of business in a new light. But the rather severe limitations imposed on directors of "Godot" - ask Joy Zinoman, Studio Theatre's former artistic director, about the hammer that came down on her in 1998 when she fiddled with the concept - mean that although the play stays forever utterly faithful to its author, it also runs the risk of turning into a museum piece." "...By all accounts, Samuel Beckett seems to have enjoyed being as obtuse as possible about Waiting for Godot. His seminal, absurdist play is considered one of the most significant of the twentieth century, and indeed, in 1955, just two years after its premier, Beckett is attributed with the almost mischievous remark, "Why people have to complicate a thing so simple I can't make out." His later responses - especially to actors trying to make sense of the characters Vladimir (aka Didi) and Estragon (aka Gogo) - only compounded this "simplicity."" 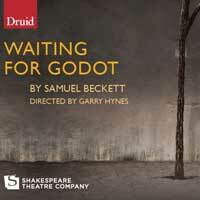 "...Washington's Shakespeare Theatre Company is hosting a polished production of Samuel Beckett's Waiting for Godot by Druid, a noted theater company from Galway, Ireland, in its Lansburgh Theatre. While the performance is well acted and as intriguing (and frustrating) as any production of this 1956 landmark, it lacks the spark that could make it more." "...“Nothing is funnier than unhappiness,” says Nell in Samuel Beckett’s Endgame. Druid’s production of Waiting for Godot at the Shakespeare Theatre Company proves the truth of this statement again and again. Director Garry Hynes, with her luminous cast: Marty Rea as Vladimir, Aaron Monaghan as Estragon, Rory Nolan as Pozzo, Garrett Lombard as Lucky, and Malcolm Fuller as the Boy, unearth a treasure-trove of comedy in this seminal piece of theater. Godot is not played for laughs; it is entertaining because of the emotional truth underlying the humor." "...The play can be very funny, and Aaron Monaghan and Marty Rea work beautifully on stage together as the long and short of it, that is Estragon and Vladimir. They somehow get the balance just right between executing the highly stylized choreography yet somehow keeping the humanity of these two lost souls in a dying and unpredictable world. When they play the comedy, and there is plenty, it is executed with precision mixed with not just a smidge of Monty Python (as in the Ministry of Silly Walks.) They manage always to ground their work in character."